Specimen displaying stress colour pattern. nigriloba: from the Latin niger, meaning ‘shining black’, and lobus, meaning ‘lobe’, in reference to the black marking on the lower caudal-fin lobe in this species. Endemic to the island of Borneo where it appears to be restricted to rivers draining Kalimantan, the Indonesian part of the island. It occurs throughout the Kapuas basin in the western province of Kalimantan Barat, including the Danau Sentarum lake system, and the Belayan and Mahakam Rivers in eastern Kalimantan Timur province. Presumably it can also be found in drainages of Kalimantan Tengah and Kalimantan Selatan provinces, but we’ve been unable to obtain any details to date. Type locality is ‘Bo River, central Borneo’. Crossocheilus species inhabit flowing streams and tributaries with substrates of boulders, pebbles, gravel and sand, often in areas with submerged driftwood or tree roots. The clear, often shallow, water allows sunlight to penetrate the surface and the development of a rich biofilm covering submerged surfaces upon which the fish browse. They are thought to undergo seasonal migrations during which they can be found in deeper, more turbid water. Base measurements of 150 ∗ 45 cm or more. It can be further furnished with driftwood branches arranged to form a network of nooks, crannies and shaded spots. While the majority of plant species will fail to thrive in such surroundings hardy types such as Microsorum, Bolbitis or Anubias spp. can be grown attached to the décor and bright lighting will promote the growth of algae upon which the fish will graze. In this kind of environment it will display more natural behaviour and can be kept alongside other species that enjoy similar conditions. Like many fishes that naturally inhabit running waters it’s intolerant to the accumulation of organic wastes and requires spotless water at all times in order to thrive. It also does best if there is a high level of dissolved oxygen and a decent level of water movement in the tank so external filters, powerheads or similar should be employed in order to obtain the desired effect. ‘Crossocheilus siamensis’ (see ‘Notes’) is famed as a consumer of ‘black brush’ algae (BBA), also known as ‘red’ or ‘beard’ algae. These members of the Division Rhodophyta can be otherwise difficult to remove once established in aquaria so the ‘species’ has achieved huge popularity among hobbyists who maintain planted set-ups. Presumably this saleability is also one reason why several fishes, including C. nigriloba, are offered under the name. These do browse on BBA but to varying extents depending on species and in some cases the availability of alternative food sources. C. atrilimes, for example, shows a preference for fine-leaved, higher plants such as Vesicularia spp. but will also feed on various types of algae. C. langei sensu amplo is the most efficient consumer of BBA although some reports state that only younger, softer growths are eaten and that the fish should be introduced prior to any potential outbreak. In nature Crossocheilus species are aufwuchs grazers feeding on algae, diatoms and other phytoplankton, plus associated microorganisms. The use of high-protein foods in the aquarium should therefore be avoided as the fish are unable to metabolise some components efficiently; regular, prolonged consumption can result in excessive deposits of fat and even organ degeneration. A good quality dried product(s) with added Spirulina or similar is ideal but plenty of fresh vegetable matter should also be included in the diet. Shelled peas, blanched courgette, spinach and chopped fruit all make good additions to the menu. Once settled into the aquarium the fish sometimes ascend into midwater to feed and in a set-up as described above will often be seen browsing the biofilm that tends to form on the rockwork. Generally peaceful and can be maintained alongside many of the more popular species in the hobby although our preference would be to select fishes from from one of its native countries or rivers. In the exceptionally diverse Danau Sentarum sympatric species include Barbonymus gonionotus, B. schwanenfeldii, Cyclocheilichthys apogon, C. janthochir, C. repasson, Epalzeorhynchos kalopterus, Labiobarbus ocellatus, Luciosoma spp., and various smaller cyprinids. Crossocheilus spp. are typically found swimming in loose aggregations in nature and can exhibit shy or skittish behaviour if kept singly or in small numbers. They are shoaling, rather than schooling, fishes which develop a distinct pecking order and are best-maintained in a group of six or more since weaker individuals may be bullied incessantly if smaller numbers are kept. You’ll be rewarded with a more natural-looking display plus interesting behaviour from the fish as they interact with one another. Not thought to have occured in the hobby and as far as we know it’s not being farmed for the trade although related species are induced to spawn artificially via the use of hormones. Members of this genus are known to undergo seasonal reproductive migrations in nature, moving upstream during the dryer months and in the opposite direction when water levels rise. This rarely-seen species is among a handful of near-identical congeners that are traded as ‘Siamese algae-eater’ (often abbreviated to ‘SAE’), ‘Siamese flying fox’ and/or Crossocheilus siamensis. The latter name is not valid, however, and is a synonym of Epalzeorhynchos siamensis which is itself a synonym of Crossocheilus oblongus, a species described from Java. 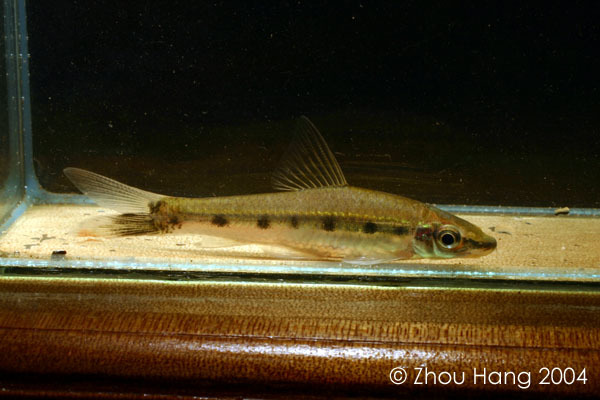 C. oblongus is currently accepted to range throughout Indochina and the Sunda Islands but its identity is unclear although its name is routinely applied to fish in the aquarium trade. It was described as a blueish fish with yellow fins and is almost certainly not the ‘SAE’ in the aquarium hobby. 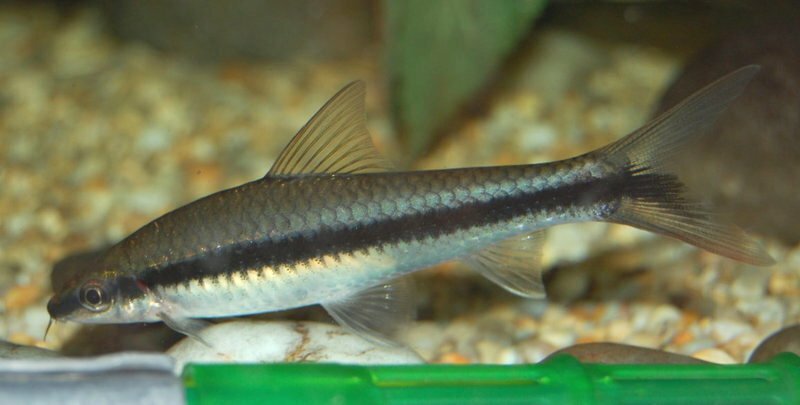 Unfortunately the fish considered to represent C. siamensis in the latter study did not derive from southern Thailand, and was later described as C. atrilimes (Kottelat, 2000). E. siamensis has probably never been seen in aquaria (the holotype represents the only-known specimen), nor is it a synonym of Crossocheilus oblongus since that species was described from Java. While separating some of the fish that may be found on sale as ‘C. siamensis’ is a tricky task, C. nigriloba is quite simple to identify. The dark lateral body stripe uniquely breaks up into a series of blotches when the fish are sparring, stressed, or sleeping, and the lower caudal fin lobe contains dark pigmentation suffused with red. The latter feature has given rise to the trade name of ‘penguin flying fox’. 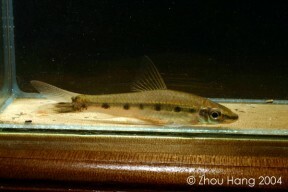 Garra cambodgiensis (often referred to incorrectly as G. taeniata and sold with the name ‘false SAE’) is vaguely similar but also easily-recognised because the dark lateral stripe ends at the caudal peduncle, all barbels are tiny and it has a disc-like lower jaw which sometimes develops bright red colouration on the outer lips. Epalzeorhynchos kalopterus, the flying fox, may also be misidentified as a Crossocheilus but exhibits several distinguishing traits, the most obvious of which are the characteristic white-edged, red and black coloured fins. Also comparable are the Paracrossochilus species from the island of Borneo but these are almost unknown in aquaria. Descriptions préliminaires des nouvelles espèces de poissons recueillies au Bornéo central par M. le Dr. A. W. Nieuwenhuis en 1898 et en 1900. My anabasis with red-algae eaters known as Crossocheilus siamensis.